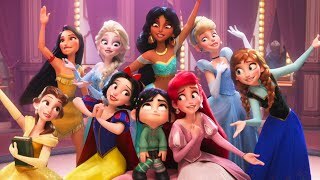 The extened Vanellope and Disney princess scene from Ralph Breaks the Internet: Wreck-It Ralph 2 + trailer. Taking place six years after the events of the first film, the story will center on Ralph's adventures in the Internet data space when a Wi-Fi router gets plugged into the arcade as he must find a replacement part to fix Sugar Rush. Along the way, Ralph and his best friend Vanellope von Schweetz encounter new customs, worlds, and characters, such as the trendy algorithm Yesss and the Disney Princess lineup. Jack McBrayer as Fix-It Felix, Jr. The film will also feature appearances of all the Disney Princesses including: Jodi Benson as Ariel, Paige O'Hara as Belle, Linda Larkin as Jasmine, Irene Bedard as Pocahontas, Ming-Na Wen as Mulan, Anika Noni Rose as Tiana, Mandy Moore as Rapunzel, and Kelly Macdonald as Merida; all of which are reprising their roles from previous films, while Snow White, Cinderella and Aurora will be voiced by new actresses. Other Disney characters will appear, with Kristen Bell as Anna and Idina Menzel as Queen Elsa from Frozen, and Auli'i Cravalho as Moana. C-3PO, R2-D2 and Yoda from Star Wars, Iron Man and Gamora from Marvel Comics will appear in the film as well. Pitch Perfect 3 Music Video "Freedom! '90 x Cups"
THE DISASTER ARTIST Movie Clip "I Did Not Hit Her"